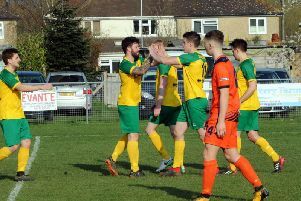 Horsham manager Dominic Di Paola praised his team for their display in what was a misleading 4-1 defeat at home to Ramsgate. He admitted they made mistakes but stressed it was just the quality of finishing where the visitors prevailed. Ramsgate scored from all of their chances while Hornets’ Alfie Rogers (twice), Steve Metcalf and Toby House all managed to miss opportunities to find the net. House nodded a header just over the bar when it should have at least hit the target. Di Paola was encouraged by his side’s performance but was obviously disappointed by the scoreline. He said: “I thought we played some of the best football we’ve played all season. We had numerous chances. “But we made some absolute clangers at the back. “Ramsgate scored four goals from four shots and we absolutely battered them. “It might sound stupid and I am prepared for any comments about cliches but at 1-1 we looked like we would on and win the game. “It was a weird one but we were the much better team. Ramsgate took the lead after 11 minutes when Aaron Millbank struck powerfully from the edge of the box. George Landais equalised on 54 minutes with a well-worked goal after a fine ball into the box by Curtis Gayler. However Millbank responded with two more goals in the next two minutes to complete his hat-trick. After plenty of attacking play at the other end, the Rams rubbed salt into the wound when Alfie Paxman made it 4-1 with five minutes to go. Di Paola revealed: “We passed to players who were out of position and our decision-making was poor, without a doubt. Hornets are at home to Ashford United in the Bostik League tonight (Tuesday) at Culver Road, Lancing. Return to this site tomorrow to read Dominic Di Paola’s reaction to the game.